Art Nouveau pieces by the Daum factory excel in eye appeal and technical wizardry. Daum Nancy Winter Cameo Vase. 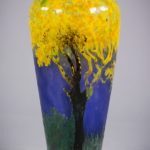 Daum Art Nouveau Mimosa Vase. It’s an impressive achievement for a family who got into glassmaking pretty much by accident. Daum came into being in 1878 after French financier Jean Daum accepted a glass factory as payment after it failed. 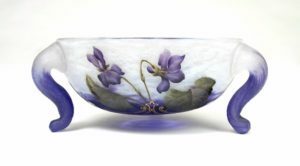 Jean died in 1885, leaving his sons, Auguste and Antonin, to lead the glassworks to its Art Nouveau heights. 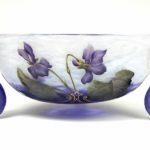 Daum outlived Gallé’s company and is chugging ahead happily today, but its most sought-after pieces are still those that it made between 1890 and 1914, when World War I forced factories to close or repurpose to serve the war effort. Daum may not have shaped the visual style of Art Nouveau to the extent that Alphonse Mucha or Gallé did, but it did make its own distinct contribution. “One thing I see in Daum glass designs is more of an emphasis on landscapes, as opposed to individual flora, as one sees in Gallé,” Oldknow says. Daum’s landscape vases draw collectors just as powerfully now as they did when they lured buyers into boutiques more than a century ago. Coveted Daum motifs include Prairie scenes, which unite a pale pink sky with green lawns full of flowers that are as distinct and identifiable as any in Botticelli’s Allegory of Spring. The artists who painted Daum Prairie scenes varied the sizes of the wild flowers to create perspective, placing the largest blooms at the bottom of the form and smaller ones above them to give the viewer the impression of looking out over a lush field. It’s certainly possible to put a piece of Daum to work, but few collectors ever take that gamble. 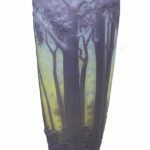 “In 12 years of visiting clients, I’ve never seen a Daum vase with water and flowers in it,” says Mike Fredericks, department head of rare lamps and glass for the James D. Julia auction house in Fairfield, Me. The only exceptions he sees are Daum lamps. They’ve always been regarded as accent lighting, and collectors place them in protected spots in a room and rewire them appropriately. 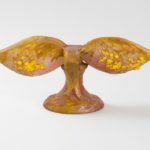 Macklowe now has an exceptionally rare and possibly unique circa-1900 Mimosa vase, which resembles a pale pink orchid dappled with golden berries. “It’s a masterpiece. I love it both for its form and its surface decoration. It’s just fabulous. 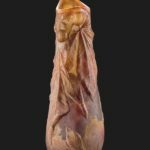 It’s the only one we’ve ever seen like this,” he says, explaining that it is comprised of four hand-blown parts—the two mimosa cups, the base, and then a tongue that folded over the base to unite it with the cups. 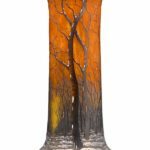 Macklowe also has a remarkable cameo glass vase that lays a thick, deep, dark green forest over a vision of a village in the distance against a sunset-orange sky. “It creates an incredible experience, like you’re standing inside the forest,” he says.